Surround sound mix of location recordings of Wicken Corn Windmil / Denver Mills and Stanton Post Mill whilst in operation. 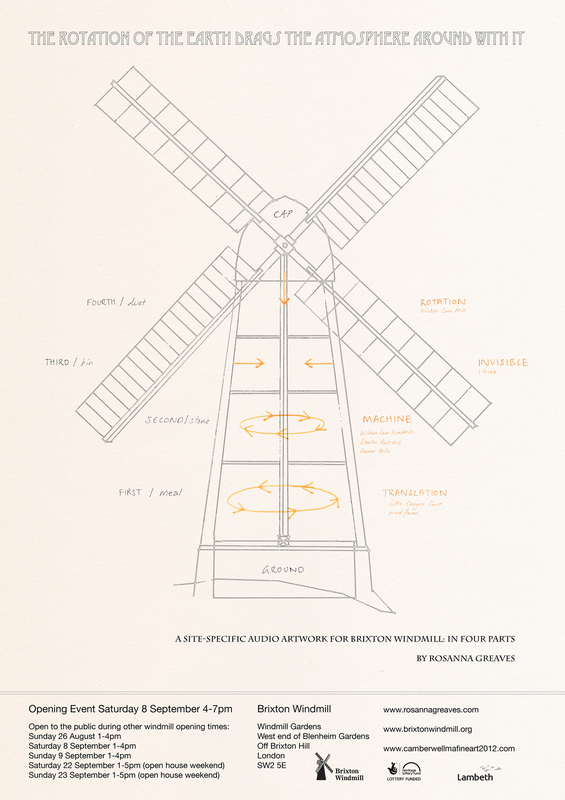 Visitors to Brixton Windmill will be able to experience the sounds of the mill as if it were working again if they visit between 26th August and 23rdSeptember. As they progress from floor-to-floor, they will be encircled by the sound of a wind farm, the grinding of cogs, pulleys and stones, the disengaged sails gently rotating and a recitation from Rabelais ‘Gargantua and Pantagruel’ about the Island of Ruach where the inhabitants eat nothing but wind. “I want people to think about a translation of this powerful machine into contemporary renewable energy, considering our consumption of energy just as the windmill and the islanders of Ruach consume the wind. The windmill and sound installation will be open to the public on the dates listed below and all visits are free. To book a place, email booking@brixtonwindmill.org.uk or call 07587 170029, with details of the required date and time. Please ask if you are unsure about physically climbing to the top of the mill or if you are thinking of taking small children. · For further information please contact the artist, Rosanna Greaves on 07799 754 894 or Nancy Platts, press officer for Friends of Windmill Gardens on 07970 487 744. · The total cost of restoring Brixton Windmill was £581,222. The Heritage Lottery Fund (HLF) has contributed £397,700. Lambeth Council £55,130, Friends of Windmill Gardens £2,000 and non-cash contributions are valued at £126, 392. · Using money raised through the National Lottery, HLF sustains and transforms a wide range of heritage for present and future generations to take part in, learn from and enjoy. From museums, parks and historic places to archaeology, natural environment and cultural traditions, we invest in every part of our diverse heritage. HLF has supported more than 30,000 projects, allocating over £4.5billion across the UK, including £868million to projects in London alone. Website: www.hlf.org.uk.